Adobe Flash Professional is the successor of a software product known as FutureSplash Animator, a vector graphics and vector animations program released in May 1996. FutureSplash Animator was developed by FutureWave Software, a small software company whose first product, SmartSketch, was a vector-based drawing program for pen-based computers. With the implosion of the pen-oriented operated systems, it was ported to Microsoft Windows as well as Apple Inc.'s Mac OS. In 1995, the company decided to add animation capabilities to their product and to create a vector-based animation platform for World Wide Web; hence FutureSplash Animator was created. (At that time, the only way to deploy such animations on the web was through the use of Java platform.) The FutureSplash animation technology was used on several notable websites such as MSN, The Simpsons website and Disney Daily Blast of The Walt Disney Company. In December 1996, Macromedia bought FutureWave and so re-branded and released FutureSplash Animator as Macromedia Flash v1.0. 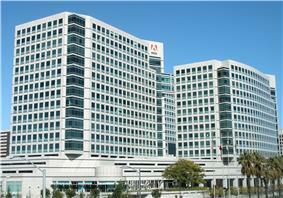 Adobe Systems acquired Macromedia in 2005. 2003 Released with Flash Player 7, new features included: Actionscript 2.0 (which enabled an PowerPoint), web services integration, video import wizard, Media Playback components (which encapsulate a complete MP3 and/or FLV player in a component that may be placed in an SWF), Data components (DataSet, XMLConnector, WebServicesConnector, XUpdateResolver, etc.) and data binding APIs, the Project Panel, v2 UI components, and Transition class libraries. 2005 Released with Flash Player 8, this version of the product has limited support for video and advanced graphical and animation effects. Macromedia Flash Professional 8 added features focused on expressiveness, quality, video, and mobile authoring. New features included Filters and blend modes, easing control for animation, enhanced stroke properties (caps and joins), object-based drawing mode, run-time bitmap caching, FlashType advanced anti-aliasing for text, On2 VP6 advanced video codec, support for alpha transparency in video, a stand-alone encoder and advanced video importer, cue point support in FLV files, an advanced video playback component, and an interactive mobile device emulator. Macromedia Flash Basic 8, a less feature-rich version of the Flash authoring tool targeted new users who only wanted to do basic drawing, animation, and interactivity. 2007 Flash CS3 is the first version of Flash released under the Adobe name. CS3 features full support for ActionScript 3.0, allows entire applications to be converted into ActionScript, adds better integration with other Adobe products such as Adobe Photoshop, and also provides better Vector drawing behavior, becoming more like Adobe Illustrator and Adobe Fireworks. 2008 Contains inverse kinematics (bones), basic 3D object manipulation, object-based animation, a text engine, and further expansions to ActionScript 3.0. CS4 allows the developer to create animations with many features absent in previous versions. 2010 Flash CS5 was released on April 12, 2010 and launched for trialling and normal buying on April 30, 2010. Flash CS5 Professional includes support for publishing iPhone applications. However, on April 8, 2010 Apple changed the terms of its Developer License to effectively ban the use of the Flash-to-iPhone compiler and on April 20, 2010 Adobe announced that they will be making no additional investments in targeting the iPhone and iPad in Flash CS5. 2011 Flash Professional CS5.5 was released in 2011. It includes improved support for publishing iPhone applications, following Apple's revision of their iOS developer terms. Flash CS5.5 also contains several features to improve mobile app workflows across devices. Some examples are: Content scaling and stage resizing, copy and paste layers, sharing symbols across FLA files, symbol rasterization, incremental compilation, auto-save and file recovery, and integration with CS Live online services. 2012 Adobe Flash Professional CS6 was released in 2012. It includes support for publishing files as HTML5 and generating sprite sheets. 2013 Flash Professional CC was released in June 2013 as part of Adobe's Creative Cloud rebrand. Changes include a native 64-bit scene rendering engine, minor performance improvements and bug fixes, and the removal of legacy features such as ActionScript 2 support. As part of the Creative Cloud suite, Flash CC also offers users the ability to synchronize settings or save files online. 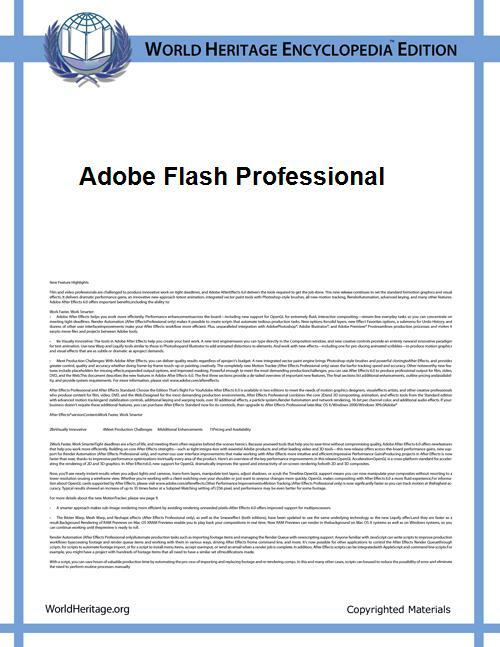 2014 Flash Professional CC (2014) was released on June 18, 2014. It includes new features such as variable-width strokes, SVG export, and WebGL publishing for animations, as well as an improved, redesigned Motion Editor. 2014 Flash Professional CC (2014.1) was released on October 6, 2014, featuring expanded WebGL publishing capabilities, freedom to create custom brushes, and the ability to import external SWFs. Also, a new SDK enables extensibility for custom platforms, letting users reach more viewers without depending on the Flash runtime. 2015 Flash Professional CC (2015) was released on June 15, 2015, featuring Lifelike animation with the Bone tool, import H.264 videos with audio, export bitmaps as spritesheet for HTML5 Canvas, brush scaling with stage zoom, universal document type converter, improved audio workflows, improved Motion Editor, panel locking, code snippet support for WebGL, enhancements in Custom Platform Support SDK, integration of latest Flash Player (version 17.0), AIR SDK (version 17.0) and CreateJS libraries, save optimizations, auto-recovery optimizations, organize imported GIFs in library, library search by linkage name, invert selection, paste and overwrite frames and reset timeline zoom to the default level.